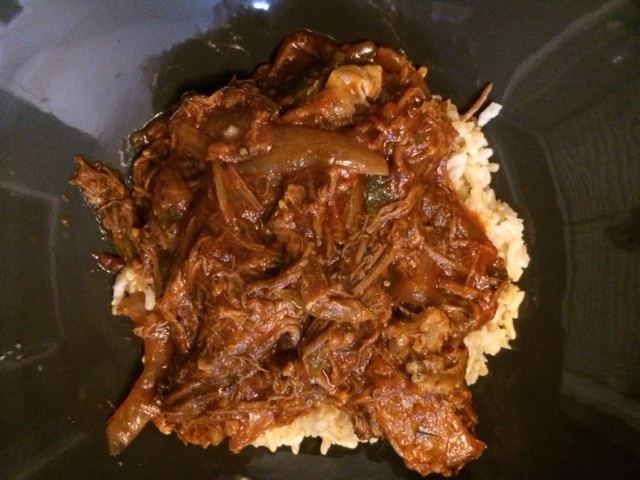 Slow Cooker Ropa Vieja | Om nom nom! Put all ingredients in the crock pot in order, and pour enough beef stock or water in to cover the meat. Cook on low for 6-8 hours. When finished, remove steak and shred. With a slotted spoon, remove the onion, garlic and peppers from the crockpot and sauté in a large frying pan. Add the tomato sauce, tomato paste and beef broth. Add the shredded beef to the tomato mixture and cook together for about 20 minutes, stirring occasionally. Serve with rice. We used brown – white would be better – or none at all, it’s still amazing! Definitely making this in April!